Cupcakes 'n Daisies: Next Up ? ? ? Before I'm done with one quilt, my mind is seriously planning the next one. Like most of you, I have my Quilt To Do List. Not a random mix of patterns and fabric in my head, but an actual list, that I write up, add to and best of all, cross off, when I complete a project. My Quilt To Do List has all my patterns with fabric, families of fabric with no pattern, and patterns that need fabric. Compared to most folks, it's a pretty short list. That would probably be due to the fact that I've not been quilting all that long, don't have easy access to a LQS, and start and finish about 12 quilts a year. So usually, by the time I get to the border on my current project, I've decided on my next project, have the fabric out, usually pressed, have read the pattern several times, have rewritten the pattern directions to suit my taste, and outlined how I want to go about cutting out my project. Well as I wrap up Route 44, I have no idea what's up next, I'm not sure why, so maybe you can help. Here's what I do know, I want to work with brown fabric, I'm in the mood for fall, and brown says fall to me. Birdseye....Nicole at Sisters Choice made this quilt and I just loved it. I picked up this Birdseye kit at Quilts Plus in Indianapolis a couple of months ago, so I've got the pattern, the fabric and the fabric has browns. I think the thing stopping me from jumping into this project is the amount of piecing involved. Route 44 had those same little four patches and I think maybe I would like something different for my next project. I think any of these patterns would work with my collection of browns. I would probably swap the pink for red on this one. This is a serious contender. 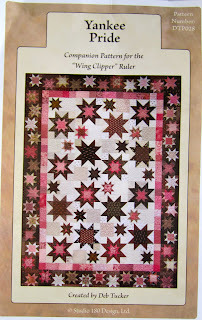 I've had my eye on this pattern for awhile, I just love that border, I would go with reds and browns on this one too. 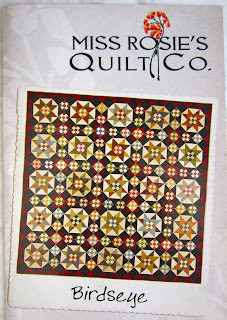 Then there's this pattern, that I picked up while visiting the Quilt Merchant. They had a kit, but Beth told me the original quilt, that this pattern was based off of, was a two color quilt, reds and creams. I was thinking I could use my browns for the corners, and go with red and creams for the center. does anything say fall better than Maison de Garance, by French General? I was thinking this pattern might be a good use of that fat eighths bundle. So that's where I am, I don't think I can make a bad choice, but after enjoying my Ashcombe and Route 44 projects so much, I'm hoping to be equally excited about the next one. Maybe I need to rethink the brown...I just don't know.....do you? Shenandoah Valley is my favourite, I tried to buy the kit awhile ago but they had sold out. Is a fat eight bundle enough for a quilt? 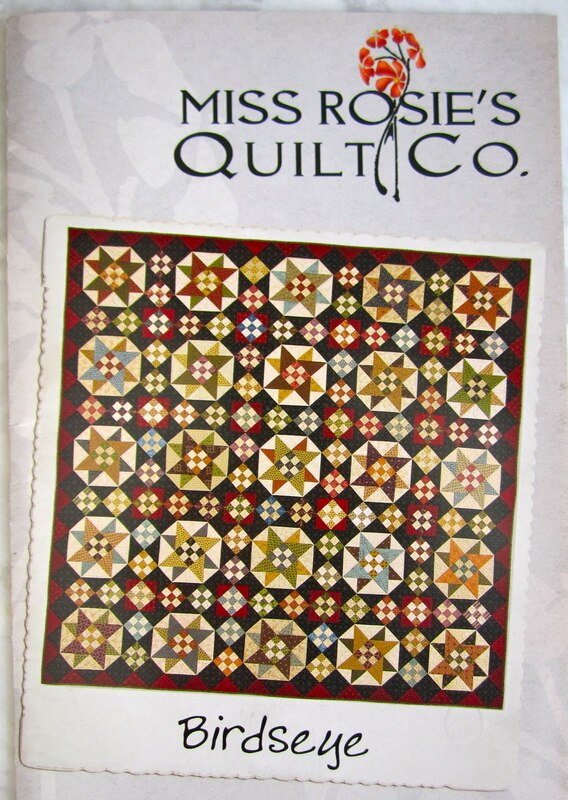 I am newish to quilting so I am unsure of quantities to buy unless I am buying for a set pattern. 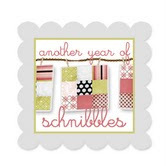 Love some of the FQ bundles but at $100 or more I am concerned if it is enough fabric or too much. So much to learn! I am sure inspiration will come soon and whatever you decide on will as always be beautiful! 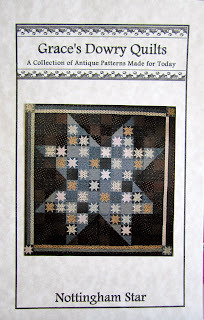 Yankee Pride is my favorite pattern of the one's you've highlighted but I like the French General fabric the best. 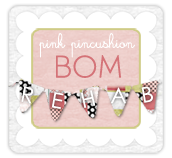 I have no doubt though that you'll find the perfect next project! You really have an eye for fabric/pattern selections! I think the Nottingham Star in browns, reds, and creams would be stunning. I really do. I've been thinking brown lately, too. I've collected a bunch of them and a bunch of creams with the idea of a Shakespeare in the Park. But the current brown and red rage is beckoning to me. I made one quilt recently from French General's browns and reds and loved it. But I'm presently trying NOT to use just one line of fabric for my next project, so perhaps the SITP will be the right thing. My second choice among your possibles would be the first pattern with the red for the brown. Will be interested to see what you decide. OH dear...I thought I was going to be so helpful, but you have chosen so many wonderful projects that I can't even eliminate any from the decision making process :( What a dilemma! to play with Maison de Garance for a MBS project and it is so gorgeous. It would look fantastic for this one I think. I just wish I had more! Oh, no! Stick with the brown. Any of the projects will be wonderful! Wonderful choice of projects! 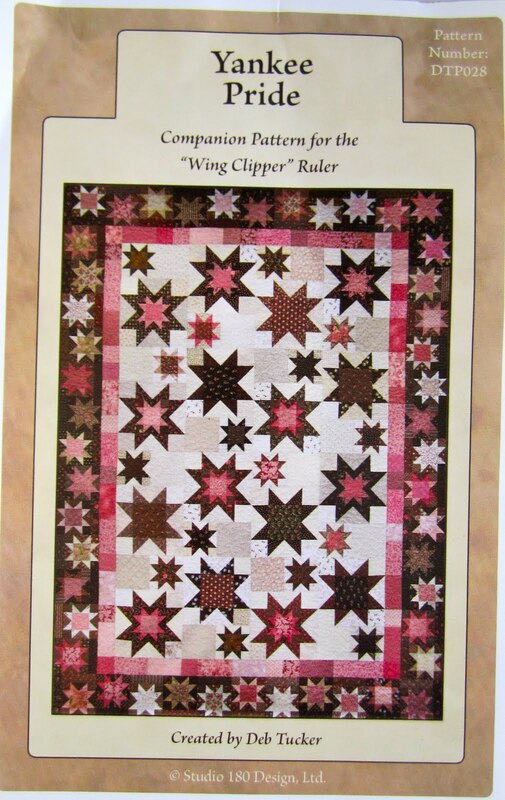 I really like the Yankee Pride star quilt as it would be different than your last two projects. But the French General line is just luscious (I'm thinking my next project is going to be Maison de Garance)and it would be so tempting to dig into that bundle. Guess I would toss a coin between these two. By the way - 12 quilts a year is a lot. Love these patterns and the fabric choices. I love anything with French General, so that would be my next project of choice. The French general project ...the fabrics are already picked and you can start cutting and piecing right away! I all for instant gratification! LOL! I really like the Maison de Garance fabric with that Park Ave. pattern. That could be fabulous. And it looks like pretty easy piecing too. Don't worry about Birdseye being tricky. It is ten times less fussy than Route 44. If I get that quilt done it is going to be a miracle, at the rate I am going! My vote is for the Maison de Garance. You can your brown fix as there are plenty of browns in that line. the maison de garance - don't think you can go wrong with that one! Oh my Thelma, I see why you are having a hard time deciding on your next project. So many good choices....as I look back over the pictures I think I like the Yankee Pride pattern with the change in colors you mentioned. I have not owned a fat eighths bundle before. Approximately, what size quilt will that bundle make? Which do you choose first usually, your pattern or fabric? I am impressed with how many quilts you make a year--your work is lovely. P.S. I meant to say, I think the browns would be great in this quilt and I agree, fun to work with this time of year. Definitely go with brown! You know I love the French General. Any of those patterns are gorgeous. So I'm absolutely no help here! I like your collection of browns with the teeny bit of red and think they would make up well in the Yankee Pride or Shenandoah Valley quilt patterns. But then, I like Birdseye (on my list too) and the Maison de Garance fabrics...I know, no help at all! I thought I was a freak that kept an ACTUAL list for my TBM (to be made) quilts. I should have known better and added you to the crazy house. LOL! I was just updating my 2010 list with those quilts that were completed and those that are being pushed to 2011. I also added the fabrics that I assigned to the projects so I won't use it for another project. I had aimed for 12 this year but Summer was so crazy that I won't be meeting my goal.. I think next year I'll try to squeeze more during spring in case I get overloaded at work in the summer. As to your next project.. I agree that Birdseye has alot of the 9 patch blocks and if you are getting out of another project with that block maybe a break might be in order. I wish I would have picked up that kit. The colors look perfect and since I picked up the pattern after Nicole completed her quilt, I'm fabricless on this one. I think that Park Ave pattern suffers the same problem than the Birdseye. I love Maison de Garance line but the square in a square and 9 patches in this pattern seem to be more of Route 44. I fell in love with Shenandoah Valley as soon as Tara posted it. I struggled not to by the kit because I had just started on my Two Piece puzzle (also by Tara) and that quilt was red/Cream and Black. The similar color tones made me hold off on picking this pattern. When you think about this one, keep in mind that it has a LOT of HST which you are already working on for your Belle Mead quilt. Do you want to make MORE HST at this moment? With that said, I just trimmed down my selection to either Nottingham Star or Yankee Pride (which I had never seen and find lovely!). At this point it's all about the how much effort you want to put into it. Sometimes I feel I need something quick and easy to cleanse my palette so to say before I move into a more complex pattern. If after Ashcombe and Route 44 you need that, go with Nottingham Star. If you are up for anything, go with Yankee Pride. It has alot of dimension to it and the star in a star adds alot of interest to that sawtooth block. It's a project that has some meat to it! LOL! Anyone you chose will ultimately be a winner because it's what speaks to you that really matters and they are all wonderful projects! wow... that was long. And I double posted. Sorry. I think your collection of browns with a little red thrown in would be great for the Yankee Pride pattern! I love Yankee Pride, I've never seen that one before...need to find it...and I also love Birdseye (I have a few of those blocks done and love them...they're really not bad to do)...I think brown is the right color for now...oh who am I kidding I think brown is always the right color. Whatever you pick...HAVE FUN! 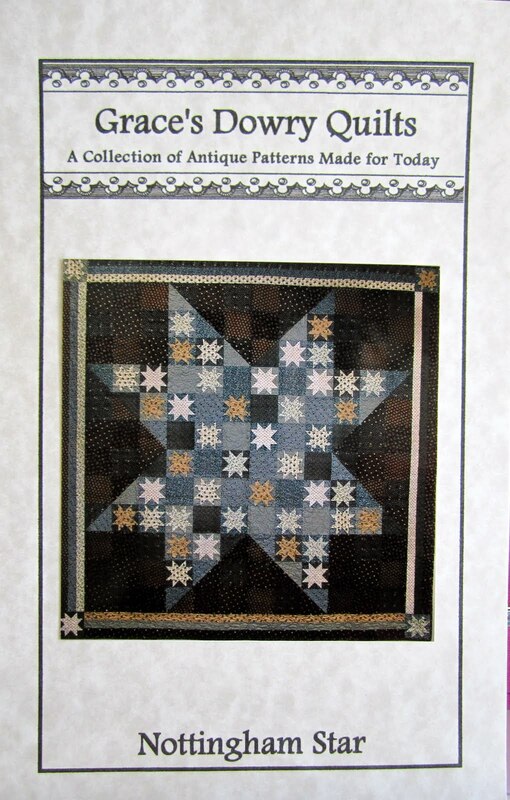 Or, if you aren't excited about any of them, and the first three are all large starry quilt, how about considering doing a smaller sampler? Even some applique? Fat eighth bundles work well for samplers. Wild Goose Chase is a fun pattern. I also like Village Square by Whimsicals. I hate it when I am not totally excited over my next project. I know you will pick something beautiful. Too many great choices! :-) I think Yankee Pride caught my eye first, if that helps. Have fun! I love the last pattern, Park Avenue. And your browns would be a lovely choice. I just bought a fat 8th bundle of Jo Morton fabrics. Haven't decided what to with them yet, so am looking at lots of patterns. Will be interested to see what you finally come up with.